MOSCOW (AP) — Immediately after being released from jail at the end of a 30-day sentence, Russian opposition leader Alexei Navalny was detained again on Monday and ordered to spend 20 more days behind bars. Navalny, President Vladimir Putin’s most visible opponent, has served numerous jail sentences for spearheading a series of unsanctioned protests across Russia. Just as he walked out of a detention center in Moscow for organizing an unauthorized rally earlier this year, a police officer took him away. The Simonovsky District Court later sentenced him to 20 days in custody on charges of staging another rally earlier this month that caused bodily harm to police officers and damaged a patrol vehicle. 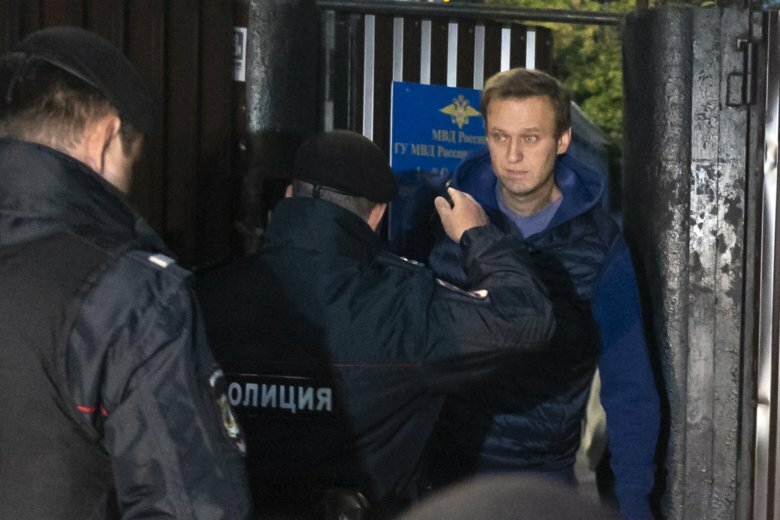 Navalny denied the allegation, saying that as he was serving the 30-day jail sentence he couldn’t have organized the unsanctioned rally. Navalny’s further detention comes amid a wave of popular discontent against an increase in the retirement age, an issue that angered Russians across the political spectrum. A drop in approval ratings for Putin and outrage at the changes in the pension system have weighed heavily on Kremlin candidates running in regional elections in Russian regions. Early results from runoff votes in Sunday’s gubernatorial elections in two Russian regions see opposition candidates beating Kremlin incumbents. A week earlier, an opposition candidate for governor in the Far East mounted protests following widespread reports of vote-rigging in favor of the Kremlin candidate. Several days later, election authorities canceled the results of the elections and called a new vote.